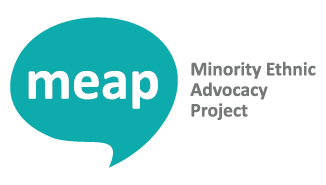 ​We have recently launched a new advocacy project called the Minority Ethnic Advocacy Project (MEAP) which is being delivered in partnership with the West of Scotland Regional Equality Council (WSREC) and Pachedu. Through our diverse staff who also have language skills in Arabic, Farsi and Urdu/Punjabi, we intend to increase the confidence of clients through inter-cultural dialogue and capacity building them to be able to do things for themselves. The main goal of the project is to connect vulnerable and isolated individuals with mainstream services they require by supporting them to understand their situation and helping them make informed decisions. We hope to help individuals from minority ethnic backgrounds to build confidence and enable empowerment. If you need support with accessing public services, filling out forms, understanding letters or attending appointments you can register with the project by completing the information below. All registration appointments are on a Wednesday between 11am-2pm, however, we can also arrange for registration sessions to be completed outside of these times if we are given advanced notice.